Offering a new level of control, piSMART® vacuum equipment makes packaging smarter. Taby, Sweden – Elevating packaging lines to the intelligence levels promised by Industry 4.0, Piab is introducing piSMART® versions of its most advanced vacuum technology products. Focused on maximized productivity and energy-efficiency, piSMART® vacuum equipment places new cloud-based analysis tools in the hands of operators. Building on intelligent features already available in some of Piab's vacuum equipment, piSMART® will offer a new level of control that underpins the pillars of Industry 4.0. For the packaging industry this means that large amounts of output data regarding, for instance, vacuum level changes can be collected and compared with data easily accessed from the cloud, offering highly intelligent Leakage Warning systems etc. Similarly, cycle counting features can reveal if the number of "picks per minute" is dropping over time, potentially indicating performance issues relating to a build-up of dirt or blocked filters. Such "big data" analysis procedures will include auto tuning, condition monitoring, predictive maintenance, simulations and real-time adjustments, based on existing Piab features such as Automatic Level Determination (ALD), Automatic Condition Monitoring (ACM), Intelligent Blow-Off (IBO), Self-Adhesion Control (SAC) and Energy Saving (ES). Piab's adoption of the generic and fieldbus-independent IO-Link is an important key to the interoperability required in Industry 4.0 processing units. IO-Link is available in piCOMPACT®, the company's flagship all-in-one vacuum ejector series, which is also the first to be offered with the new piSMART® feature. Other high-end vacuum equipment used for packaging and palletizing will follow this lead. 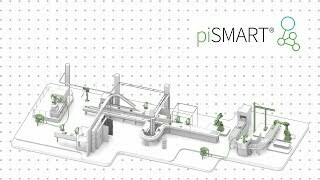 Piab also plans to extend the piSMART® transformation to include conveyors and lifting systems, elevating also these to the unprecedented levels of optimization, efficiency and user-friendliness characterizing Industry 4.0 factories.